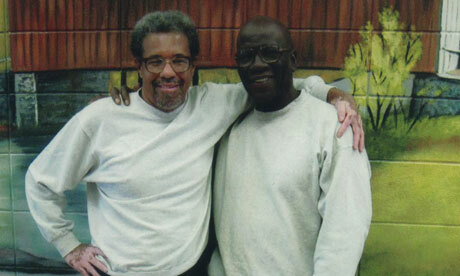 (L to R) Albert Woodfox, who is suing prison officials in Louisiana after more than 40 years in solitary confinement, and Herman Wallace, who died in 2013 three days after being released from prison, also after decades in solitary. Albert Woodfox has been in solitary confinement for much of the past 40 years. Along with Herman Wallace and Robert King, Woodfox is one of the “Angola Three,” three members of the Black Panther Party who spent much of their lives in solitary confinement inside the walls of Louisiana State Prison, Angola. King was released in 2001, after 29 years in solitary confinement. Wallace, who was recently featured in the documentary film “Herman’s House,” died in 2013, three days after his release from prison. The last member of the Angola Three still incarcerated, Woodfox launched a lawsuit to challenge his continued solitary confinement, and along with Robert King, is seeking damages from prison officials. The family of Herman Wallace, settled with the state. The Prison Complex caught up with George Kendall Director of the Public Defender Initiative, at Squire Patton Boggs, who is working on the case. They were in need of counsel for the civil solitary confinement case and I was surprised to hear that someone had been in solitary more than 30 years. That lead us to meet Mr Wallace, Mr Woodfox, and Mr King and we agreed to take their case. We’ve had that civil case ever since. You’ve mentioned that these three people have spent a considerable amount of time in solitary, tell us more about their case? Mr Woodfox and Mr Wallace were placed in solitary in April of 1972 in the wake of a stabbing death of a correctional officer at Louisiana State Prison, Angola which at the time was a really horrific prison by all accounts, everyone agrees with that. Robert King was transferred from New Olreans to Louisiana State Prison a couple of weeks later. He was thrown directly into solitary confinement. He was there until his liberation in February 2001 He was wrongly convicted of a murder in 1973, that conviction was overturned when all of the witnesses recanted their testimony. He was released from solitary confinement right out to the streets and has done remarkably well despite the fact he spent 29 years in solitary. However Mr Wallace, who unfortunately passed away last October, he stayed in solitary confinement from April 1972 up until October 1st of last year, 2013, except for when he spent 9 months in a dormitory in 2008. So he spent more than 40 years in solitary confinement. Mr Woodfox has been in solitary since 1972 except for a period when he was awaiting retrial in his case in 1997 through 1999 and again there was a 10 month period in 2008 when he and Mr Wallace and other inmates lived very peacefully in their dormitory in Louisiana State Prison. Have you seen the cells they are held in? We have visited them often. We have toured with expert witnesses the cell blocks in which they live. First in Louisiana State Prison in Angola and then Mr Wallace spent the last few years in solitary cells in Hunt Prison also in Louisiana. Mr Woodfox has also been in solitary cells in Wade Prison and we’ve seen those as well. How would you describe the cells? They are very small, there’s no window in the cell. There’s a window the other side of the hallway. For five or six months of the year it’s extraordinarily hot. The only thing that’s done about that is there are fans that blow and when those fans blow it’s nearly impossible to speak with anybody without yelling very loudly, so there’s very little communication between anyone on the tier. Mr Woodfox was transferred from Louisiana State Prison to Wade in 2010 and has been in a 6 x 8 cell. He gets out one hour a day, five days a week, and fifteen minutes for a shower. And two or three of those days he can go outside into a small cage basically where he gets light and he can exercise and occasionally he will get visits, even more occasionally go to some other part of the jail to see a doctor or whatever. But on weekends he gets 15 minutes out of his cell and that’s it. So he’s spent an enormous amount of his life in that tiny cell. And Mr Wallace, it was virtually the same for him at Angola and Hunt prison and it was virtually the same for Mr King when he did 28 years in Angola. What effects does Albert Woodfox say this has had on him? We’re all social animals. Imagine spending the weekend in your bathroom and if you think you would have a hard time spending the weekend in your bathroom just imagine what it must be like and what the consequences might be of spending days, weeks, months, years, decades in that same setting. All these guys have sleep issues, Mr Woodfox particularly has had claustrophobic attacks. And there’s a social awkwardness that comes when you’re around other people. So they worked very hard to make sure they did not succumb to taking medicines, psychotropic medicines. A lot of people have become mentally ill or their mental illness is greatly exacerbated by these conditions. It’s taken enormous discipline to not be in far worse shape than they are. Why do you think they have been kept in solitary so long? There’s no warden who wanted to be the one to release them to less confining circumstances given the fact that two of them have been convicted of being involved in the killing of a prison guard. This is one of those times that a federal judge is going to have to tell them that they are going to have to release Mr Woodfox. Could you tell us more about the lawsuit you’re currently working on for Albert Woodfox? This lawsuit is filed on behalf of Mr Woodfox and Mr King. Mr Woodfox is still held in solitary so one very major goal of the lawsuit is to order the Department of Corrections to release him from solitary confinement and place him in general population. Every time hes been in general population he’s been just fine and he’ll be just fine again but it’s going to take a judge order to see that happens. We’re quite confident that when we go to trial we’ll be able to win that order. He along with Mr King are seeking monetary damages. This goes well beyond the pail of what is supposed to happen or what’s meant to happen in prisons. There’s been no penalogical justification to hold these guys for anywhere near this kind of time and so the wardens and others violated clearly the constitution and they ought to pay for it. The lawsuit is alleging that this is a violation of the Eighth Amendment? There are a number of claims. One is that simply to hold somebody in these very restrictive circumstances without justification is a textbook example of a violation of the Eighth Amendment (prohibition on) cruel and unusual punishment. It’s a cardinal rule in American corrections that prisons function best when prisoners are held in the least restrictive environment, that it is necessary to ensure that they get along well and they are no threat to staff or prisoners.. That cardinal rule has been run rough shod over for decades. These guys have been kept in far more restrictive circumstances than any of the facts justified and that’s why this lawsuit was filed and that’s why we’re going to prevail. The second claim… every 90 days that they’re put in solitary confinement they’re meant to review that… Every ninety days there’s a recommendation: do we keep this person here in these highly restrictive circumstances or do we place them in less restrictive environments. Well, these kinds of 90 day reviews have gone on for 40 years with Mr Woodfox and they’re clearly just a sham. He did not have a violation for years and years and the ones he’s had in the last 20 years have been extremely minor. Tell us what happened last week? There was an issue within this large civil case. When he (Albert Woodfox) was moved in 2010 we had to also sue the warden and some other staff at this new prison. And those new defendants objected to being sued… Under American law before they have to go to trial they can seek an appeal in the court of appeals of whether or not the suit can be maintained against them. Judge Brady our trial judge had denied that motion and said you have to stay in the case, they appealed that and we were hopeful that after the argument the three judge panel was going to agree with Judge Brady. If the Three judge panel affirms and says these defendants are going to stay int he case then the case will go back to the district court, there will be a trial date set we’ll do some more discovery and we’ll try that case without further delay in 2015. There’s been a lot more attention in recent years to the issue of solitary confinement, do you think there are wider implication of this case? I think the country is reexamining the use of solitary and I think there’s a growing judgement that it’s been over-used and ought to be used in a much more measured way. We truly can’t afford to keep people for years in this type of incarceration that’s much more expensive to administer than other types of incarceration that would guarantee safety and allow the smooth running of institutions. This entry was posted on Monday, October 20th, 2014 at 7:37 pm	and is filed under Other Articles. You can follow any responses to this entry through the RSS 2.0 feed. Responses are currently closed, but you can trackback from your own site.